Lemon & Rye vinaigrette sautéed shrimp served with rice. over roasted garlic mashed potatoes. pesto served over sautéed spinach. -Served with Saving Daylight, Citrus Wheat. Seating will be extremely limited so make sure you act quickly to grab a ticket! On top of this amazing food and beer pairing for the evening, two special guests will be walking you through the whole experience. Ask questions, make comments, embrace every bite and sip! Our Executive Chef will be describing each course in detail to show its uniqueness and deliciousness. 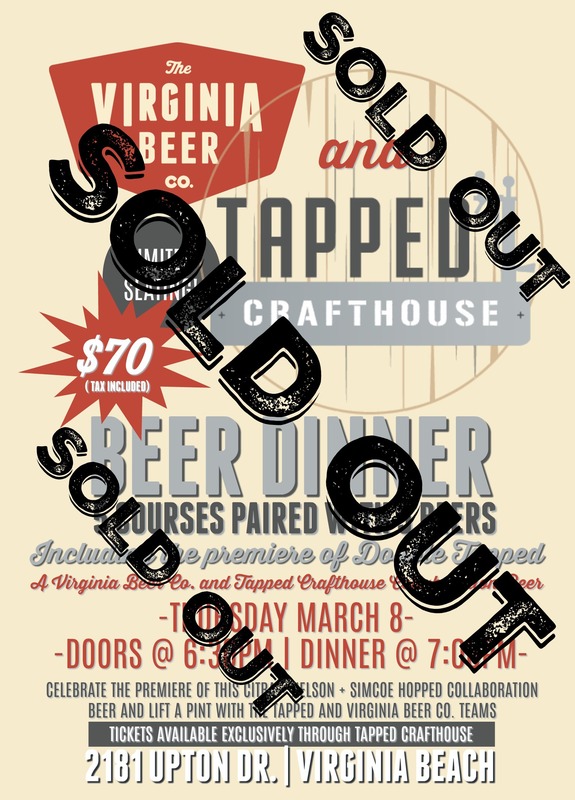 Michael Rhodes, from The Virginia Beer Company (VBC) will also be there to guide you through the beer pairing and breakdown of each amazing VBC beer being presented. And….If all of this wasn’t enough, Course 4 brings a special treat for every guest lucky enough to grab a spot! We’ll be featuring for the first time ever our Tapped/ Virginia Beer Company Collaboration, Double Tapped 2xIPA. Make sure you don’t miss out on this one night only, one of a kind experience! We’ll see you dinner! Cheers! Next Post: a Draft & a…..Dram?